Would you like to make your own Koji and Miso?? We are having workshops with a special instructor, Ms. Marika Groen. – March 9th /10th (Saturday and Sunday) Koji workshop 5 SEATS LEFT!! – March 11th (Monday) Miso Workshop 4 SEATS LEFT!! Koji and fermentation in life. This is a weekend crash course on Koji making and wild fermentation that’s deeply rooted in Japanese folk culture. The lesson is suitable for all level. Ms. Marika will guide you through every step so you can do it at home. You wouldn’t need a professional facility for this. ⚠You can take Koji back home with you. “Miso” is widely used in both traditional and modern Japanese cuisine, and has been gaining worldwide interest over the last years. In this workshop, you will be fully guided through the preparing methods of this traditional Japanese fermented soybean paste or fermented chickpea paste. You will make your own Miso and receive a lecture on the Japanese folk culture behind it. By sample tasting many different kinds of Miso, you will understand the difference and also learn how to use them. You will go home with a jar of your Miso-to-be that you will look after it for about a year. 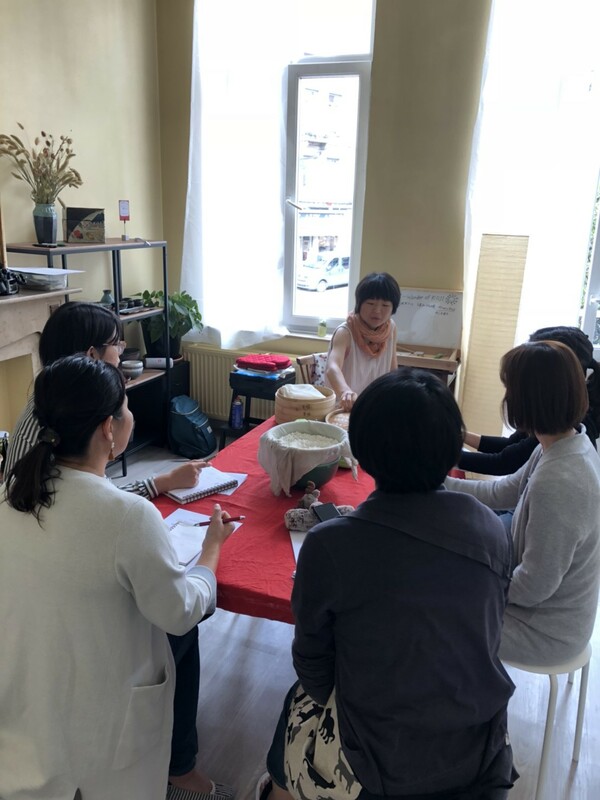 As for jars, we imported Tokoname ceramic jars(1L) from Tokoname, Japan, especially for this workshop. If you purchase this jar, you can prepare your Miso in it and take it home with you! The price is 30 euros (White/Blue/Brown) Limited stock only. Please let us know in advance when booking if you would like to purchase it! ⚠Please choose Miso(soybean) or Miso(chickpea) when booking. ⚠You can take Miso back home with you. ・a cleaned and dried 1000 ml container with a wide top to bring miso home. Do not bring a bottle as the top is too narrow. ★If you participate in both workshops, the total fee is only 210€(without a purchase of Tokoname jar)! ★Please make an application and pay for the workshop by February 20th. ★Each workshop is for 10 persons. The application will be closed when participants reaches to 10 people. ★No reimbursement will be made with cancellations after February 25th. photographer/a lazy cook. Periodically hosting an intensive Koji class as well as workshops to make Miso, Doburoku, Natto, and other fermented food and drinks. Now organizes fermentation tours and camps in Japan and disseminates its culture in Europe. Loves wild-crafting and home brewing. Inhabits Malicafe Organic Vegan Food.